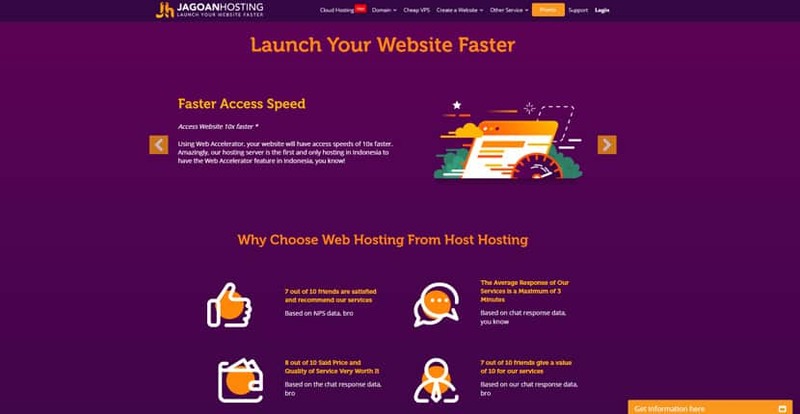 JagoanHosting Review 2019: Is JagoanHosting a Good Hosting? With a customer satisfaction rate of 70%, Jagoan Hosting is a darling among hosting customers in Indonesia and Singapore. They offer affordable Cloud shared hosting packages and VPS along with hosted emails and SSL certificates. One of the cheapest hosting services in Indonesia, Jagoan Hosting has been offering web hosting, Cloud hosting, and VPS to thousands of customers since 2007. Some of its technology partners include Google and VeriSign. Currently, their website is only available in Indonesian. With data centers in Jakarta and Surabaya, the company serves more than 25,000 domain and hosting customers. Jagoan Hosting has the capacity to provide 99.9% network uptime thanks to their redundant hardware that uses the latest Intel Xeon processors and SSD storage disks. Connected to low-latency Tier-1 network system, their servers not only make your websites fast but accessible from anywhere in the world. The Fame package is their introductory plan. With 500MB storage and a single database, it’s suitable for personal blogs, landing pages, and catalog websites. You also get 10 email boxes, class B support, restriction free domain extensions, and a set of developer tools. Up next is the Hits package which comes with 1GB storage space, 10 databases, and 25 email boxes. It is suitable for hosting web portfolios, online stores, and simple web apps. The Superstar package – their most popular plan – is suitable for hosting media-rich websites, app websites, and e-commerce websites. With it, you get 20 databases and unlimited storage in addition to one free .com for a lifetime, as well as all the other features of the preceding plans. The main advantage of this package is the 24/7 Class A priority support. Jagoan Hosting has four Cheap Cloud VPS plans; Seceng, Cenggo, Goceng, and Ceban with a good number of configurations. With any of the plans, you get 512MB to 2GB RAM, 1-4 core processors, 15-40GB SSD storage, and a VPS panel. You can order and deploy your VPS in seconds with just a few clicks. Fully replicable and upgradable, their VPS packages also come with unlimited bandwidth. You can upload your website or use their one-click app installer to launch ready-made apps and your favorite CMS. Jagoan Hosting offers some of the cheapest offshore hosting packages around. Their mantra is “what you pay for is what you get.” If you’re starting out, their low-cost and fixed-price shared hosting plans may be good for you. But as your business grows, you may want to switch to their Pay as You Go VPS with daily billing cycles. You can add more resources to your VPS or resize your server without changing your configurations. They will only bill you for what you order and use. By migrating your websites to Jagoan Hosting account, you stand to receive a 20% discount. With a friendly support team, Jagoan Hosting guarantees you fast responses to your queries and timely assistance on a range of hosting issues. I couldn’t interact with them as they only offer support in Indonesian. The average response time according to customers is about three minutes. If you run into any problems, you can easily reach them via email, live chat, telephone call, and ticketing system. By leveraging superior hosting equipment and infrastructure that meets international standards, Jagoan Hosting can provide you with risk-free shared hosting and reliable VPS solutions at a very fair price. Wondering how JagoanHosting stacks up against other Web Hosting companies? Enter any other Web Hosting company and we will give you a side-by-side comparison.